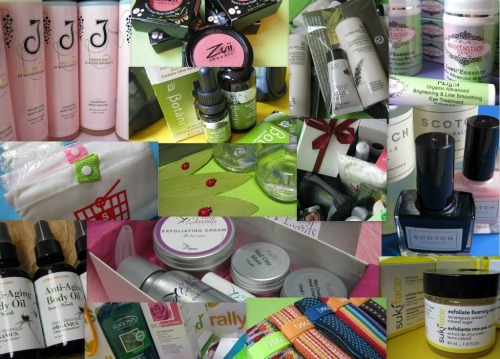 Here’s another addition to the VivaBella Green Beauty Box Giveaway, and this time from Sweetsation Therapy. The USA based company has sponsored S$400 worth of skin care products – five sets of their Lumi*Essence Brightening treatment & I*Light eye cream – that are made with natural and organic ingredients free of artificial additives. Some of you may also recall my review of their Sun*Si’Belle Organic Triple Action Moisturizing Sunscreen SPF 30+ that is highly rated by EWG as amongst the best sunscreens for the past three years. Besides their sunscreens, Sweetsation Therapy has developed a range of skin care products that are affordable, safe and effective for both mothers and babies. In fact, the brand was created by Natalia, a new mother with 20 years of skin care and cosmetic background who wanted the best natural and organic products at affordable prices. So Sweetsation Therapy’s products contain the best of natural active ingredients, such as superberries, CoQ10, Caviar, Pearl, Silk and many others. The company also uses minimal packaging and even has a recycling system in place where customers can return their used Sweetsation packaging to receive a coupon or samples. 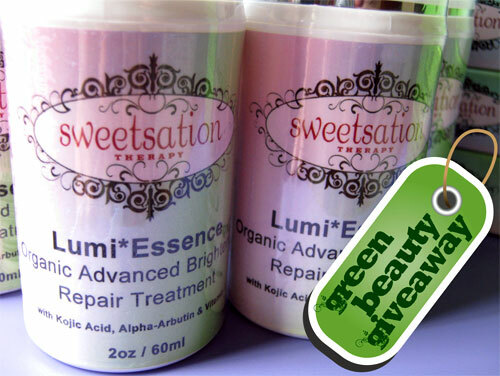 If you want to win the set of Lumi*Essence Brightening treatment & I*Light eye cream plus the other Green Beauty Box goodies, go check outÂ Sweetsation Therapy websiteÂ and tell me what you like about their products. Do ‘Like’ their Facebook page to stay tune to their updates and promotions. In the meantime, you may like to know that Sweetsation Therapy has a special promo code set up for Viva Woman readers. Just use the code â€œvivaâ€ during checkout to enjoy 20% off their products. A great time to shop for X’mas! 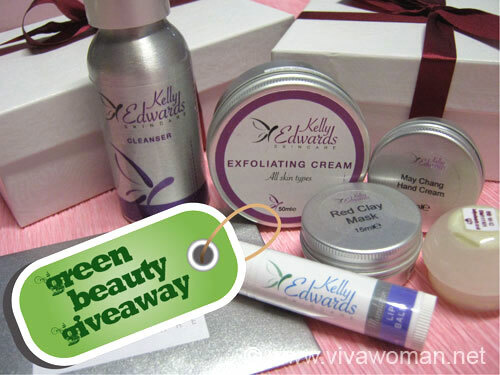 We’re coming to the end of the VivaBella Green Beauty Box Giveaway real soon. If you haven’t been participating, I don’t know what you’re waiting for really. 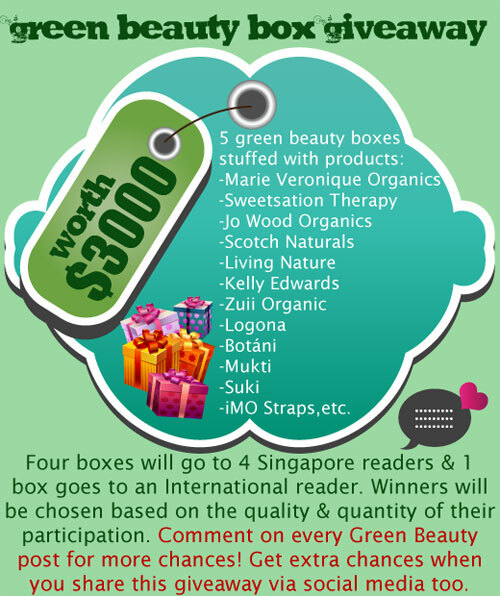 But those who are subscribed to my Facebook page would know that the value of the items has increased to nearly S$3000 now, which means each winner can get S$600 worth of green goodies! I’ll update again once the last batch of items comes in. Previous Post: « Share: would you cut your own bangs or fringe? I love just how pure their ingredients are, and their focus on antioxidants.Their products sound beyond incredible. 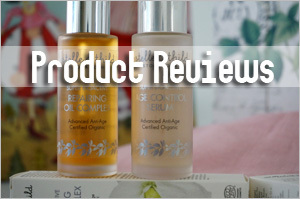 I adore their family focus and the fact they have products for babies! Thanks again for introducing me to another wonderful company, with a conscience. Cannot wait to explore & try their products. I have fun browsing their site is packed with all best find eco-friendly items. I also found out their adorable â€œRecycle and Rewardedâ€ program, interesting. There are plenty of choices at Sweetsation Therapy that you will have fun with. I had liked their FB page & retwett your tweet for this giveawway. oh wow whee! 😀 I’ve tried sweetsation before when you posted that review a long time back. I found the sunscreen a little too rich for my skin but nonetheless a very carefully thought product. I’m thinking it’ll be better for dry skin or usage in drier climates. It’s wonderful how this brand has come about as pregnant woman do not to have safe cosmetics and their kids and babies should have skin safe products too! Great for all the mums out there. thanks for the reassurance! 🙂 I’ve been having lots of whiteheads this few months. and it might have been due to the change in my cleansers and they all have coconut oil. I’m yet to find out the cause so I hope it’s not the coconut oil! Yet another nice product you’ve got there!! I seldom use sunscreen as I find them very sticky and uncomfortable. But I need to use them!After reading your posts, I think i would like to give it a try.^^The key ingredients are mostly fruits and will definitely give out a fruity fragrance. I am eyeing ont the eye treatment. Other than applying good eye gel,I dont know what else I can do to reduce my super panda eyes. I will admit that I’ve only very recently been enlightened on the importance of using sunscreen, so to see that this eco-(and skin)-friendly label carries a tinted moisturizer (the Sun*Si’Belle Organic Triple Action Moisturizing Sunscreen SPF 30+) is just a delight for me. Plus, if the reviews are to be believed, it also carries a pleasant floral scent, which is a nice change from how a tube of sunscreen normally smells, which is just icky. Another product I would love to try is the C*Bella Organic Brightening Toner. 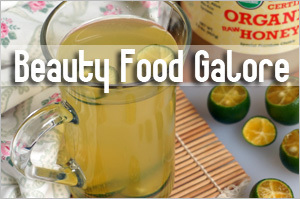 I love how it consists of so many natural ingredients such as organic lemons and oranges. 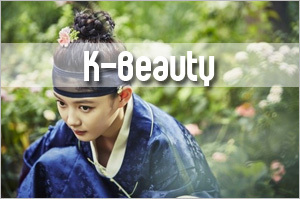 I’ve browsed the website, and I especially like the face products. The ingredients are so fruity and they are formulated to target different skin concerns and skin types. I would like to try the I*Light Organic Advanced Brightening & Line Smoothing Eye Treatment as I’m still looking for the right eye cream for me. As I have some spots on my cheek, it might be a good idea to try Lumi*Essence Organic Advanced Brightening Repair Treatment. The information given for each products are very detailed, including the Directions of use, which provide advice based on skin types. This is real helpful to customers. Sweetsation Therapy’s products emphasizes on healing existing skin surface damage, preventing future damage to the skin and repairing inner skin layer. The multiple functions that the products give are worth the price. I’m very particular about using sunscreens before I step out of home, currently I’m using Heliocare spf 50 Advanced gel, it feels cool to apply due to the gel texture and while it protects my skin from the sun rays, it calms my irritated skin when I get rashes or suffer from pimples. It’s close to my expectations for a sunscreen but because it doesn’t provide moisturizing properties, I had to apply a separate layer of moisturizer with antioxidants before putting on sunscreen. And with that, my skin feels heavy from the products. I would like to try Sun*Si’Belle+ Organic Triple Action Moisturizing Sunscreen SPF 50+, with Antioxidants, CoQ10 and Hyaluronic Acid as it seems to be in a liquid formula than the typical cream/lotion/gel. With the liquid texture, perhaps it can reduce the burden on the skin. I don’t have high expectations for eye products as nothing I’ve tried fulfill their claims to remove dark eye circles, wrinkles. Now I’m simply finishing up samples, gift with purchase that I have on hand for moisturizing the eye area. I’ve liked their FB page and RT-ed your tweet for this giveaway. no parabens, no phthalates, no formaldehyde, no artificial frangrance, no artifical colorants, no retinols, no sulfates, no petrochemicals, no oxybenzone…. are these for real? Whatelse could i ask for, anything product from them is good! 1) In their “bad ingredients” category, Mexoryl SX is there (on pg 4). I was quite surprised to see this cos I remember you mentioned before it’s a good sunscreen ingredient. And I checked EWG and it’s rated as No. 2 there. So although Sweetsation mentions that avobenzone is often added together with Mexoryl, I thought it’s quite misleading to put Mexoryl under the “bad” ingredients list. What do you think? Also, it says on their website “the only product in which it [Mexoryl] is currently used is L’Oreal’s Anthelios SX”. I don’t think this is correct, right? (believe Vichy and Skinceuticals also have products with Mexoryl). So their website is not up to date?? Yes, Octinoxate is the only chemical there. 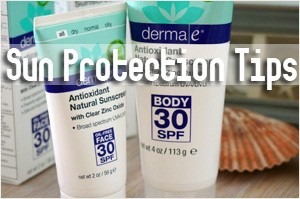 It’s the only way to achieve high protection of SPF 50. 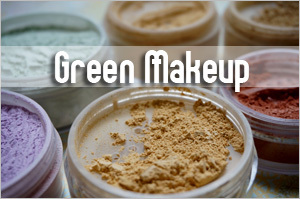 Blended with other green ingredients, it doesn’t pose any danger. Yes, unfortunately Bellygoods had to close its doors, due to the owner’s personal reasons. 🙁 But we do ship International. Hi Pollya: I’ll answer your query on Mexoryl SX since Nat has answered the other two. I think the reason why it is listed as bad ingredient is cos it’s a chemical filter. It is a good ingredient on its own but I suppose those in the natural camp are not in favor of them. Plus the sunscreens containing this ingredient always contain other chemical/synthetic ingredients that are classified as the “dirty dozens”. As for why it’s listed as only used in L’Oreal, my guess is because Vichy and others are not available in US. FDA took awhile to approve this ingredient and hence, we’re ahead of them in terms of using this ingredient in other sunscreens. Thanks Nat and Sesame for the replies! OK, I guess I can understand if the “natural campers” consider Mexoryl ‘bad’ cos it’s a chemical ingredient. Too bad Bellygoods has closed down. As I was thinking of getting some of these as Xmas gifts, it might be too risky to use international shipping as they might not arrive on time. What I like about their products? Well, on the initial superficial level, I like the names. Think Sun “n” Fun Baby Sunscreen, Sun*Si’Belle, Sun “n” Berry Fun etc. Once their funny punny names grab my attention, then I move on to reading the descriptions and scrutinising the ingredients. Kelp is used pretty often in many of their products and that appeals to me, as in my mind it’s like a La Mer product without the fillers and unnecessary price tag! Again one line of products I haven’t tried yet. I read about Sun*Si’Belle spf on EWG sunscreen list but since it contains octinoxate, I gave up on trying. 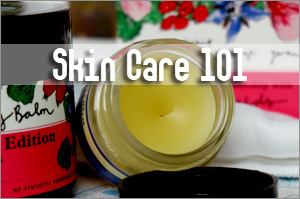 I checked their website and I really like the way they categorize ingredients of skin care products. Especially list of bad ingredients that should be avoid. I would like to try their products for babies, Yummi Tummi Choco Butter with Calendula and Organic Calendula Baby Butter Cream. Calendula is a great calming ingredient. Well, all of their products look very appealing, fruity and yummy. I have been using Sweetsation Therapy skin products for almost one year. These products have in that time evened out my skin tone and the age spots are much less noticeable (this, after decades using another set of products and watching the spots only get darker). All the formulations absorb into the skin without residue, the exception being the SPF products, which aren’t supposed to. Very happy with their customer service as well. I just love how non txic and natural they r. I had the kids sunscreen for my two kids this summer and lOved them. Def buyin more next year!! I stumbled upon your blog early last year when I was searching for organic natural sunscreen for myself and my children. At that time, we were still store bought sunblock for the kids as I was still learning about organic sunblocks, and that was only for face. It was then that I saw your comments on Sweetsation Therapy and I went to read and googled for reviews. Then of cos, after reading those reviews, I bought 2 sets of Baby Sweet Kisses Gift Set “Sunny Fun”, 1 set as a gift for my friend’s kids and 1 for mine. I must say that my son loves it. He as very sensitive skin, thus my search for non chemical stuff began. He really loved the chocolatey scent of the sunblock and after sun lotion. I’ve re-ordered the Choco*Smooch Organic Baby Lip & Face Balm, with Argan, Calendula and Sea Buckthorn for him as he has dry lips and they crack often. As for myself, I’ve tried the Lumi*Essence Brightening treatment & I*Light eye cream and I’ve into my 2nd order of these 2. I even bought extras for my mother. What I would really want to try next from them is the Very*Berry Organic Oxygen Masque & Scrub with Antioxidants, Vitamin C & Superberries. And now with 20%, I’m going to place another round of order for the Choco*Smooch Organic Baby Lip & Face Balm for my boy as we are running out soon. I’ve shared this give away on fb. 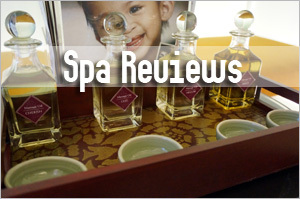 I’ve already liked Sweetsation Therapy since I started using their products. Meantime I was also looking baby sunscreen for myself because I wanted a sunscreen which is mild, non-tinted, mineral based and must has very light texture. However, I was disappointed Wweetstation baby sunscreens contain chemical sunscreen ingredient and I was quite puzzle why they have long ingredient list for baby sunscreen? Especially most brands were always trying to keep baby sunscreen ingredient minimal and mineral based (my experience with Asian brands and natural brands). The baby sunscreen that contains chemical sunscreen ( Octinoxate ) is Sun’n’Berry Fun Organic Baby Sunscreen SPF 50 but Sun’n’Fun Organic Baby Sunscreen SPF 30 is mineral based. 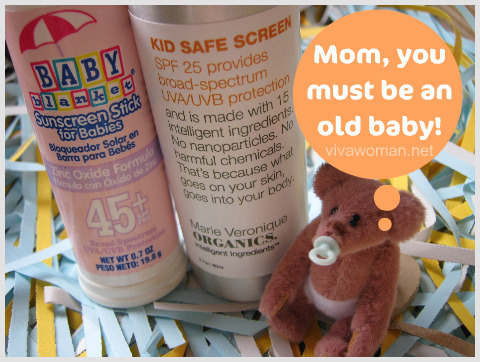 May be SPF30 is just enough for baby, after all baby is not recommended having sun insolation. 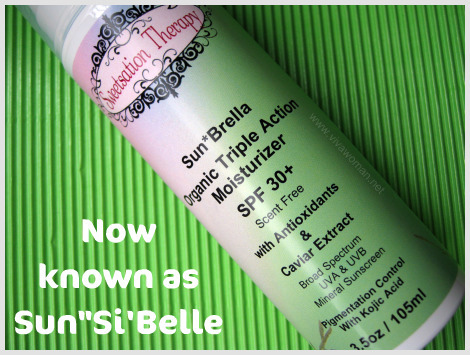 I’m interested in the Sun*Si’Belle Organic Triple Action Moisturizing Sunscreen SPF 30+. It’s very hard to find organic sunscreen that is also non-greasy. I have combination skin, and alot of sunscreen out there are either greasy or have alcohol content in them. What I like about their products is that its natural and free of parabens or perfumes, i prefer my products as simple as possible instead of adding everything non-essential chemicals inside in which the list of ingredients is so much that with other products I pile on my face, I do not know if they’ll react against each other or not. All of their products are formulated with natural and organic ingredients that are good for the skin and body and safe for moms and babies. I like how the company included pictures and descriptions of the ingredients used in their products on the website. One product I would like to try is Very Berry Organic Oxygen Masque & Scrub with Antioxidants, Vitamin C & Superberries. The scrub contains 10 super berry and fruit ingredients, such as papaya, pineapple, strawberry, kiwi, grape fruit, etc., to rejuvenate the skin and minimize pores. While the vitamin C in the scrub helps repair sun damage, honeyâ€™s natural antioxidant helps protect the skin from the sunâ€™s rays. 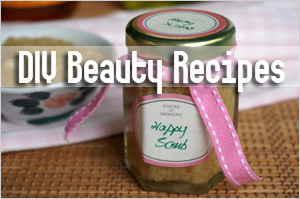 This scrub is recommended for acne prone skin type. 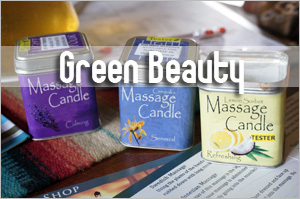 A responsible company who believes in being At Sweetsation Therapy we believe in being environmentally conscious and living green. Packaging containers are 100% recycable. Their products are biodegradable and made with natural and organic ingredient with minimal packaging to eliminate unnecessary parts. Its a very enviromental friendly Company, and saving the earth. I like how they have a wide range of products with specific targets. They aren’t too pricey either. I just love the fact that there are more and more healthy beauty choices we can made so that we can get away from the big commercial names that produce mostly ineffective products and rely heavily on marketing. As for sweetsation, can I first say that I love their website? 🙂 And the fact that they support all these good causes. As for their products, I would love to try their Sun*Si’Belle+ Organic Triple Action Moisturizing Sunscreen SPF 50+ – being fair-skinned in a Mediterranean country makes it necessary to wear high-SPF all year round. I’ve not tried this brand yet, but I have a close friend who used this line while she was pregnant. She says they are good products, and she now even use the shampoo and sunscreen for her baby. The price range is not bad for natural products. I would like to try de skin care regime and the anti-cellulite treatment, since they are not many natural options for this particular problem. I like that they are natural products aimed for mothers and babies. And their price are surprisingly good! I would love to try one of their sunscreens and their Very*Berry Organic Oxygen Masque & Scrub with Antioxidants, Vitamin C & Superberries. I really like their Recycle and be Rewarded program, where you can collect 5 empty containers from their products, send them in, and receive free samples. So unique and a great idea (plus I have 3 containers already that, when empty, I can plan to send in)! I also love that their products smell amazing and fresh. They really smell like the natural ingredients they’re made with–none of those sickly sweet artificial scents! That is something I appreciate and LOVE about this company! And because of this, really anyone of any age and gender can enjoy their products (my significant other loved my Cucumber Day Cream on his face–I need to get him some!). They are also so customer-friendly! I can’t say this enough. Each time I have spoken with someone from the company, I truly felt that I was heard, and that company personnel were so helpful and friendly to me. I also like them on facebook, and think they have one of the most enjoyable facebook profiles as they are wonderful to all of the Sweetsation fans, and do many updates for people to follow occurrences within the company. I’m just thankful that Sweetsation Therapy exists!! I like that they don’t contain a lot of ingredients that I now try to avoid–and that they have products safe for babies, pregnant and breastfeeding moms. It might come as a shock to some people that not all natural products are considered safe for expectant mothers as even some essential oils are not suitable for pregnant women. I think Sweetsation Therapy also stands firmly on the advocacy of being green as it doesn’t just create and sell health-safe products that are eco-friendly, they go the extra step by encouraging their customers to leave greener footprints too by offering rewards for returning empty Sweetsation Therapy product bottles. …and now, on to vanity’s perspective… they have a couple of brightening products (you’re including two brightening products in your Green Beauty campaign but I saw that they also have a toner, mask and moisturizing face screen with brightening properties) which I’ve always been a sucker for. I spend a lot on brightening serums for the face and the skin around the eyes since I suffer from uneven skin tone and heavy dark circles. wow the brand really sounds exotic with their ingredients as you have mentioned – superberries, CoQ10, Caviar, Pearl, Silk!!! just checked out their website…awesome products and the website looks so cozy!!! First of all, Sesame, this blog is bad for my wallet!I am trying to cut down on unnatural products and here I am finding out more about more natural products day by day. Looks like there are some things I am going to try like mineral makeup and water based nail polish, instead of giving them up. The most interesting fact about Sweetsation Therapy is that they collaborate with dermatologists. I love speaking to dermatologist and read books written by them. However, many of them believe in using drugs, chemical cosmetics and invasive treatments. 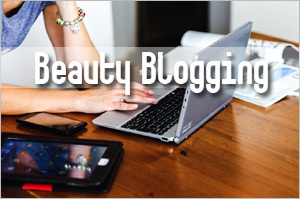 It is good to combine the expertise of dermatologists to produce more natural cosmetics. The Morning Sickness Alleviating Lipbalm caught my attention. While I may not have morning sickness anytime soon, I thought this will be a thoughtful and cute present for pregnant friends. I really like how they photographs their products. Everything seems good enough to eat, especially Very*Berry Organic Oxygen Masque & Scrub with Antioxidants, Vitamin C & Superberries. It reminds me of Lush’ fresh mask which only last about a week or so. I wonder how long is the shelf life for this. Kudos to Natalie, the founder of Sweetsation, for taking a bold step out to create organic and natural products for the masses. Other than working with dermatologists, I appreciate the fact that it is environmental conscious. So many products out there create so much unnecessary waste with the numerous non-recyclable packaging just to look good and made your money feel that its “well spent”. I am interested to try out Siâ€™Belle Organic Triple Action Moisturizing Sunscreen SPF 30+ (because its been rated as the best sunscreen by EWG), I*Light Organic Advanced Brightening & Line Smoothing Eye Treatment ( to treat my forever haggard eyes) and Very*Berry Organic Oxygen Masque & Scrub with Antioxidants, Vitamin C & Superberries ( I am a mask-lover!). I like that you don’t have to hunt for their full product ingredients – they’re right there on every product page 🙂 Their Organic Morning Sickness Alleviating Lip Balm sounds intriguing too – not that I’m pregnant, haha 🙂 But it’s definitely an interesting twist – I’ve never seen lip balm marketed for morning sickness before! hi sesame..what i like about sweetstation is their ingredients.The ingredient list gives you everything there is in a product, from the highest concentration at the top of the list to the lowest concentration at the bottom. it is very good to know that sweetsation products are free of oxybenzone:),a popular sunblock ingredient which gets the highest hazardous score on cosmetic safety database â€“ scary to think that this same ingredient is even used in many childrenâ€™s sunscreens!Sadly, our governments still do not regulate the skin care industry, so it is totally up to the consumers to be vigilant about what they use on their skin, sinceÃ‚ the skin is the largest organ in our bodies. I like that the products are natural and affordable, normally you can’t find both in one company. I think other than that I like the ingredients the most…no bad stuff all good stuff. First time I’ve heard of this brand! Considering getting the baby range as the gift to my godson! I like their packaging. Well, first off the packaging is very appealing. But I love that they want to just deliver a good product. I think I will recommend this brand. Thanks. Is it sad that I would purchase a product for cuter packaging? Oooh.. Sweetsation Therapy has anti-cellulite treatment product! I just love the way they mentioned that using their Svelte PRO Supercharged Organic Anti-Cellulite Treatment with L’Carnitine & CoQ10 is a lazy way to combat those stubborn excess fat and water retention. Imagine using it along with targeted exercise movesâ€¦. Anyway, unlike other anti-cellulite treatments that promise reduction of cellulite by the burning of the fat, this one inhibits a type of enzyme from storing fat into our body. Very interesting product. Apart from that, the use of natural and organic ingredients mean that no chemical build-up in our body. Another product I would love to try is Organic Morning Sickness Alleviating Lip Balm (boyâ€¦ they sure have a witty way of naming each of their products, ROFL!!!). I just canâ€™t shy away from lip balms made of olive and rosehip oil. Too tempting. Then thereâ€™s the packaging, a clip-cap lip balmâ€¦ hook it to your keychain and youâ€™ll never forget to leave home without it. For some reason, I’m not terribly excited about their packaging. I mean, there’s nothing wrong with it, it’s cute, but it doesn’t make me want to buy it. Then again, products are not about how they look, but what’s in them and if they work that counts. I think it’s wonderful that it’s baby-friendly and it states that. I have a niece who already has skin problems and dry skin even though she’s barely a year old! It’s a bit heartbreaking. (And while researching for greener products a few years back, I saw so many comments on bad baby skin conditions 🙁 )I think I’ll buy some of the baby products as a Christmas gift for her. Thanks for the promo code! And the products is totally affordable to start with! I love that they like to use lots fruits in their products, haha. and also that for some of the products, they lists the ingredients and each of their benefits. However, I wish they did that to more of their products instead of just some. The story behind Sweetsation gives me comfort and confidence that Natalia understands the concerns that we ladies have towards our skincare. For that, Sweetsation scores brownie points with me. The ingredients in I*Light Eye Treatment is top of the range, with goji, gingko biloba, CoQ10, the berries and so much more! These are highly recommended nutritious food, so I can imagine it’ll really help with my dark eye circles. I like how Lumi Essense will help to improve the radiance on skin, which would really help my mom as she has some pigmentation. Reading the ‘about us’ section of Sweetsensation really touched me because I have a friend hard at work in the delivery room right now and it just occurred to me how difficult it is in this modern industrialized, commercialized or basically money-oriented world to do something as simple as taking GOOD care of ourselves and those precious to us. What I like the most of their products is how they take the ‘Worry’ out of choosing products suitable for babies and and their efforts towards chemical-free, green and clean products suitable for our bodies and souls. I’d definitely make it a point to visit this website for the upcoming baby shower for my dear friend’s baby boy! I have been sleeping late of late, and is going to have eyebag soon. My favourite product is I*Light Organic Advanced Brightening & Line Smoothing Eye Treatment! Treatment for my eyes with all the goodness in it! I like the detailed description and instructions … I need them! WOW, another 20% discount code – yeah! i want it! i need it! pick me pick me~~!